A University of Texas graduate, Steve Haberman pursued legal studies at UCLA before embarking on a career as a legal assistant. Stock market investments made travel abroad possible, and he has since visited Europe extensively, including London, Paris, Prague, Berlin, as well as Milan. Many of these feature as settings in his two ebook novels. "Murder Without Pity," a murder mystery, occurs in Paris. "The Killing Ploy" is set partially in several Continental capitals. He is presently at work on a sequel to "The Killing Ploy," which will also use foreign locales. Stanislas Cassel in the French justice department has been persuaded by thugs with German accent to give a certain witness, Louis Boucher, an easy time when he is interviewed about a murder case. That makes him investigate further although it first scares him. So he redoubles his attempts to find out why seemingly harmless pensioner Léon Pincus was murdered. He begins to unearth connections that go back to the occupation. This becomes difficult for Stansislas, himself the grandchild of a collabo, and he realizes he is opening himself to danger and criticism. Up to now he has tried to keep a low profile, and busy himself with dealing with minor crimes. But he has to meet this challenge for the sake of justice and redemption. As a friend quotes, “But if I am for myself only, then what am I?” There is a greater good. Based on actual events, the action takes place against a contemporary background of violence and riots in Paris due to an Austrian right winger being acquitted by jury. The far right is rising again and causing a lot of unrest. There is tension and a dark, brooding atmosphere throughout the novel. The characters develop as we read. Cassel seems dry and remote to start with, but his personality and moral goodness emerge gradually. Other people are gradually revealed in their true colours, with some surprises for the reader. There is a respectable, almost old fashioned feeling to the writing initially, to match Cassel himself, but like him, its incredible power soon becomes apparent. This is an unusual and gripping novel, superbly written and a thought-provoking pleasure to read. 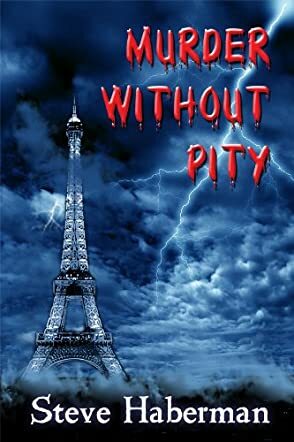 Murder Without Pity by Steve Haberman takes us to the Paris of today, a city struggling to come to terms, like many European cities, with its multi-ethnic and multi-cultural melting pot. There is a strong populist movement of the Far Right gaining notoriety and ascendancy in Paris. State criminal investigator Stanislas Cassel is well noted around the Palace of Justice for his dogged determination and inability to be swayed by rhetoric. Facts and evidence are the grist of his life. Haunted by the stain of his grandfather’s propaganda on behalf of the Nazis during World War II, Cassel knows well that memories in France are long and bitter, especially where collaborators with the Nazis are concerned. Little does he realise when he begins his latest “little misery,” investigating the strange death of a nondescript pensioner, what doors and problems will be opened along the way. I found the setting of Haberman’s Murder Without Pity to be dark and gritty, perhaps reflecting the same feelings of the people of France as they come to terms with the rise of political violence and the emergence of a powerful Far Right movement. Paris, it seemed, was eternally shrouded in a damp, clinging and chilling fog and this fitted in perfectly with the tone of the story. This book was almost totally about the main character, Stanislas Cassel, and I found the author did an excellent job of painting this character, with his limp and his permanent tiredness, but also his determination to seek the truth in this particular case. I was surprised that the anti-collaborator sentiment was still so strong amongst the people, despite the war being so many years ago, but not being French, I guess that could well be the case. Murder Without Pity was a good, solid mystery, and one well worth solving.